I only know one person who was downtown on 9/11, and today I’ve invited her, my dear friend Gina, to tell her story. May it remind us all of the lasting effects of that day, and that everyone who experienced a loss on that day is a real person. After one semester at Pace University, I decided it was time to move on. Unlike many other students attending that semester, it wasn’t because of September 11, however I understand the reasons many would leave. I’ll never forget the cloud that covered our windows that day, or the people running past our building, or the confusion of everyone around me. I was only two blocks away. The morning of was as normal as ever. I was studying for my Business Law class when we heard a loud blast and felt our building shake. Agreeing it was most likely a subway accident, we went to class. Minutes later, I left my class to see the destruction of the twin towers. In disbelief, I sat near the phone booths; I did everything I could not to look out those windows again. I felt safe by the phones. Students kindly offered me quarters to call home (cell phones were barely working at this point) and asking me to walk home with them, figuring leaving Manhattan was the safest idea. But I knew I couldn’t go home without making sure the two people that I knew were in New York were OK — my dad and a childhood friend. I planned to find them once my cell phone started working, however, as I was about to leave the building we were told it’s not safe and we had to stay inside, that we should even go to the second and third levels because of debris coming through the doors. Shortly after, we were all told we must leave because the stability of the building was at risk. Terrified to walk the streets alone, I dragged my feet trying not to listen to the outburst of a man begging to use the payphone knowing his daughter was in one of the towers that morning. I sat for a minute, not sure where to head to next, and a police officer abruptly told me I must leave the area immediately. I finally got in touch with my stepmother and knew where to head to find my father; he was waiting for me. She told me she loved me before we hung up as if she might not get to say it again. I walked past a government building and another police officer told me I must turn my cell phone off immediately. He explained something about information being transmitted? I followed his instructions, but without my cell phone I felt lost and alone. My walk uptown to find my father was heartwarming. The people of New York City already had signs up for free water and blankets. Although in shock, we knew it was a time to come together. Farther uptown, the mood changed. There weren’t any signs and there was more indifference, as if I had changed cities from one block to the next. Even so, there was a solemn tone to the city. I didn’t get home until about 10 p.m. After I walked over the Manhattan Bridge with my Dad, I saw the smoke taking over the Brooklyn sky. I went back to school after a couple weeks. They couldn’t open right away because the dust and debris would be detrimental to our health and they were reviewing the stability of the building. My subway only went as far as Canal Street the rest of the semester, so I would had to walk the same walk I did on that day. Sometimes I took a different route, because although the signs of support that were hung so proudly out of the Lower East Side establishments were endearing, they were also a sordid reminder that we are not invincible. I rarely have nightmares anymore. When I do, I am always with someone I love, and of course I’m with my cat. The care I noticed from New Yorkers on that day has reminded me we are not entirely alone, even in our darkest hour. It is for this reason that I will always love New York. Entertaining guests can be a daunting experience when you’re new here. Knowing your way around remains a challenge for months after you arrive, and when you’re responsible for guiding someone else as well, it can be a LOT to handle. • Emphasize the vast amount of walking involved. For the largest subway system in the world, it still doesn’t go everywhere — especially the far east or west sides of the island (Alphabet City, Meatpacking). Many people land in New York with a suitcase of their most city-chic shoes and outfits, but do encourage them to forfeit at least some vanity while here. Even comfy footwear causes blisters after a day of walking, so have them pack a foot-fixer kit of moleskin, neosporin, band-aids and gel insoles. • Keep a spare set of towels, shampoo and (if you don’t already use one) a small hairdryer. Because these things are a pain to pack. • Warn them about the smallness. Their bathroom at home is probably bigger than your bedroom. • If they want show tickets to things that book up months in advance, like Wicked, let them know months in advance. • If they have an iPhone, have them download Hopstop or CityTransit. Life savers. • Ask for their food preferences and have restaurant ideas in mind. This is one thing that is easier done by you than them — and it will keep you from wandering around the city going, “Let’s just walk until we find a place to eat.” Twenty minutes later, no one can decide and everyone’s hangry. • What’s in it for you: Out-of-towners allow you break routine and be a tourist in your own city. You’ll love the looks on their faces when they see for the first time what you see every day. Plus, what are the odds you’d ever go to Ellis Island with your friends on a random Saturday? Yeah, you so wouldn’t. I’ll stop there — I could add to this list forever. What’d I miss? Coming soon: Where to take your out-of-town guests! 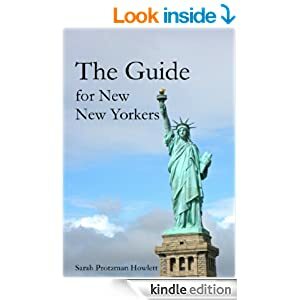 Advice on how to handle the most touristy places on your checklist, as well as where to show them slices of real New York life.